The bar for video game adaptations is so low by this point, that Lara Croft herself would be venturing deep into the earth just so she can raid it. Yes, it’s a commonly stated fact that films based on games are usually not very good, with Mortal Kombat, Assassin’s Creed and all seven Resident Evil movies being among the numerous examples, but whenever there is a new one on the horizon there is a shimmer of hope that maybe, just maybe, this latest one can finally buck the trend, and we can finally have a good video game movie to set as the absolute standard. Of course, more often than not those hopes are dashed as soon as the actual movie is seen, but in the case of Tomb Raider – the rejuvenated effort to bring pixelated heroine Lara Croft to the big screen, following two previous movies with Angelina Jolie in the role – this is perhaps the closest we’re going to get to a fairly solid video game movie in a long while. Does that mean it’s good? Not necessarily, but it doesn’t mean it’s absolutely terrible, either – which, for a video game adaptation, is friggin’ phenomenal. Based off the more recent versions of the game, the film stars Alicia Vikander as Croft, a young woman who spends her time in the gym and cycling the streets of London as a courier – all to get her mind off the fact that her father, wealthy explorer Richard Croft (Dominic West), disappeared seven years ago and is presumed dead. She soon discovers a clue that leads her across the seas to a remote island off the coast of Hong Kong, and into the hands of shady archaeologist Mathias Vogel (Walton Goggins) who is searching for the hidden tomb of an ancient Japanese Queen, and now it’s up to Lara to try and stop him and the shady organisation he’s working for from unleashing its power upon the world. There are plenty of things to talk about with this movie, both good and bad, and no matter what you may end up thinking about this movie, I will understand if you either like it or hate it. That’s because the film as a whole is kind of a mixed bag; on the one hand, it falls into a lot of holes that many other video game movies fall into, including the uninspired plot, thin characters, and action scenes that feel like you’re watching someone play – what else? – a video game, but on the other hand, you can tell that the people who made this were at least trying to make this not as rubbish as the others, and there are parts of it that are entertaining enough to just about hold your interest, which prevents it from being wholly boring. One of those things, first and foremost, is Alicia Vikander as Lara Croft. 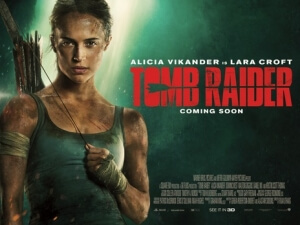 It’s honestly unfair to compare her version of the character to Jolie’s interpretation, largely because this is a reboot and is designed to stand far apart from the previous Tomb Raider movies (plus, I’ve only seen one of the two movies she was in, and even then it’s been many years since I’ve seen it so I can’t remember much about it). Luckily, Vikander brings the character to life in a way that’s not been seen on the big screen before, as someone who’s somewhat of a thrill-seeker but also vulnerable and unsure of her place in the world, and the actress gives her small mannerisms and personality traits that don’t entirely make her a bland cardboard cut-out. She is easily the best part of this movie, as she carries scenes firmly on her shoulders even as they get more and more ridiculous, and is a strong enough actress to sell some of the more questionable plot points and dialogue the incredibly flawed script forces her to act out. The script is its most major downfall, as it sets up a backstory through long-winded exposition and very little in terms of character development, so entire characters like Daniel Wu’s sailor who is set up to be a fairly important side character turn out to only exist so they can give information to the main character and then be pushed aside for the rest of the movie, given almost nothing else to do for its running time. There are also characters that are introduced who you can tell as soon as they show up on-screen – largely down to how they’re written, and also due to who’s playing them – are going to turn out to be less than trustworthy by the end, because why would you get this particular actor to play this seemingly unimportant part unless they turn out to be the bad guy by the end? Needless to say, for an attempt to rejuvenate a film franchise, they picked probably the most stock screenplay they could have gone with, which is a shame because Vikander is so good in this movie that her version of the character deserves a much better outing. It doesn’t have very good action either, as much of it either takes place in the dark making it hard to see, or has so much blatant CGI plastered all over it that it’s hard to get fully invested. It’s not until the final third, which actually sees some tomb raiding in a movie called Tomb Raider, where things pick up a little in terms of the action and suspense, though it’s impossible not to watch it and think of the climaxes of the last two Indiana Jones movies spliced together. For its many, many flaws, Tomb Raider is nowhere close to being one of the worst video game movies ever; in fact, it’s one of the better ones because at least it has elements to it that aren’t a complete waste of time, and again for the most part you can tell they were at least trying to make this one good. It just turned out to not be anything spectacular, either. Tomb Raider has elements to it that elevate it above some of the far worse video game adaptations, including a strong lead performance by Alicia Vikander, but a stock script and uninteresting action keep it from being one of the truly great ones.